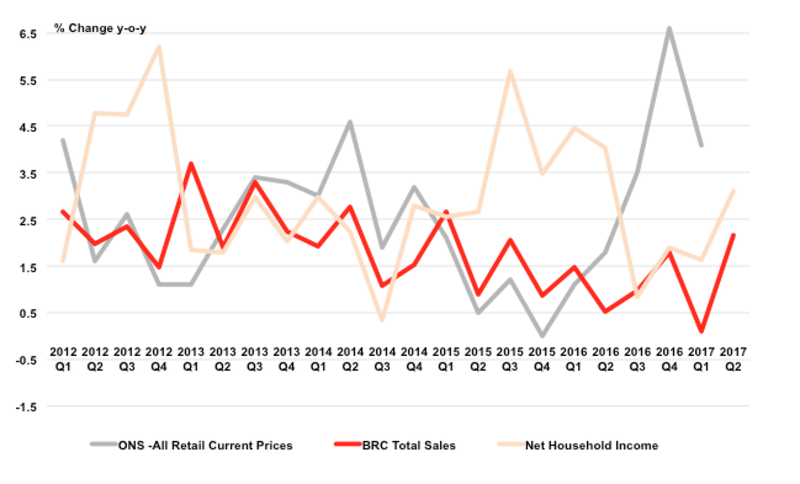 The first quarter of 2017 was much weaker for retail than the previous three months, both the British Retail Consortium and the Office for National Statistics can agree, but beyond that, there's precious little that can reconcile their figures. The ONS says there was a Christmas boom in retail sales, which slowed as the new year started, while the BRC says it was no more than a minor uptick and that growth was all but absent in the first quarter of 2017. Net household income growth (income minus tax, NICs, interest and council tax), which has recently seen periods where it has run in line with the BRC total sales figure, show that the toughest quarter for households in the past year was actually 2016 Q3, when extra income tax and NIC payments hammered household finances. This effect was also strong in Q4 and 2017 Q1, giving some rationale to the slowdown in spending growth. As for the April BRC figures, up 6.3% in total, some of this was clearly due to the shift in the date of Easter into the month from March in 2016. Taking the three month trailing average as a rough indicator of what the second quarter holds, the income figures, up 3.1% year-on-year, point to a mild recovery in the middle of the year from a poor spring, as the burden from higher tax payments tails off (according to the Office for Budget Responsibility) and net growth recovers. Whether this translates into real terms growth for retailers depends on how much shop price inflation accelerates, which is very much in their hands – this year they can have mild sales value growth or some sales volume growth, but not both.